Listen as our Judge Mike gets confused by the inane rambling of our two debaters. Will Ryan be able to deliver an unpretentious argument? Will Nick realize he needs to do more than five minutes of research? Will Mike throw away his Catholic convictions? Will Producer Grant figure out the difference between Lizziy Caplan and Natalie Portman? Listen and find out! 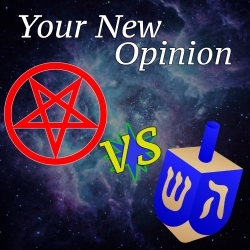 It's pentagram VS dreidel in: Which is the correct religion?